A leading LGBT+ lawyer and environmental activist used fossil fuels to burn himself to death in New York in a drastic protest against climate catastrophe. David Buckel’s body was found by onlookers in Brooklyn’s Prospect Park. Police said the 60-year-old was pronounced dead at about 6.30am yesterday in what they deemed to be a suicide. The Daily News reported that the activist left the note in a shopping cart nearby, saying he hoped his death would be “honourable” and “might serve others”. Mr Buckel’s mention of “pollution .. oozing inhabitability” and “air made unhealthy by fossil fuels” suggests that he was concerned by atmospheric pollution caused by the internal combustion engine, and rightly so. On the other hand, the Independent’s article speaks of “a drastic protest against climate catastrophe” and links the words “fossil fuels” to an article entitled: Shell predicted dangers of fossil fuels and climate change in 1980s. Was it the unfortunate Mr Buckel who confused pollution from motor cars with catastrophic climate change, or the author of the Independent article? In the former case, the confusion may be said to have been resolved, however tragically. In the latter case, the confusion persists, and may lead to further tragic incidents. Was Mr Buckel misled by the EPA’s identification of CO2 as a pollutant into thinking that he was being asphyxiated by greenhouse gasses? Was he perhaps the first of the millions of victims of global warming we’ve been warned about? All sorts of witti and humour popped into my mind after reading of this poor man’s demise, but none are appropriate. What could impel anyone to take such drastic action (I know Buddhist priests did in Vietnam but then they believed in reincarnation)? Indeed he was one of the victims of the false demonization of fossil fuels by climate activists. How ironic, a boon to mankind is portrayed as a threat, to the extent that the misguided immolate themselves. How many more are to come? Alan, as so often, you beat me to it. I heard this shocking news on Radio 4 while travelling in the car yesterday. Strangely, by later in the day, on a longer news bulletin, the BBC seemed to have dropped it and moved on. Perhaps they realise that such tragically insane behaviour damages their cause of climate alarmism rather than helps it? I find it desperately sad that an apparently intelligent and well-meaning person could be so brainwashed by this climate religion that they choose to behave like this. This is more evidence of the religious nature of climate change alarmism. Read about people attending COP23, and although you’ll find many who are there simply to lobby and chase money, and many who are there for the jolly, there are many more (mostly young people) whose brainwashing seems to be but a step or two away from this, to judge by the earnest claptrap they spout all over the internet. It’s a dangerous situation, but what can be done about it? Mark. This is only the extreme tip of climate extremism. Far more significant, IMHO, are the views and activities of those who are, for their climate beliefs, willing to break the law (in many cases morphing their anti-nuclear beliefs). Even more worrying (to me at least) is the way parts of our legal system are prepared to use concern for the environment as a legitimate excuse for such law breaking. With our education system and increasing amounts of our legal system in the climate activism camp, I see little cause for optimism. Need to go for a walk with the dog to raise my spirits. Family away on holiday in Japan. Testing – my recent comment didn’t appear. The note did not mention climate – as quoted here it talked about pollution and unhealthy air. The Telegraph headline is High-profile gay rights lawyer sets himself alight in New York park in suicide protest against fossil fuels while CNN’s is Prominent gay rights lawyer sets himself on fire in protest suicide. Even the Guardan’s report is more accurate than the BBC, which currently appears to be the least reliable source of reporting on climate and environment issues (another example coming up soon). written in the same style but from the “Dark Side”. Judith Curry, Jeff Id, Freeman Dyson, Richard Lindzen, hey I’ve got a file a foot thick! recreated in fiction and Jane Austin characterization at sea. Fergit globull-cli-sc-alarmism. How tragoc that his extremist ideology led him to the delusion that “fossil fuels” are only a negative on the Earth and humanity. How pathetic that the “green” movement has fed this sort of extremism without accountability. As the post above points out, this event arose out of an extreme form of chemophobia. That fear has been at the root of environmental scares since Rachel Carson’s “Silent Spring.” By using terms like “carbon pollution”, climatists also tie their wagon to that same horse. No wonder progressive journalists have it all muddled together. I’ve looked at Buckel’s bio. He gained prominence as a gay rights/LGBT lawyer and was very well known in the composting world apparently, being also a very keen gardener. He does not appear to have a history of environmental and especially climate activism. This makes his decision to immolate himself in protest against supposed climate catastrophe/fossil fuel pollution all the more puzzling. Did he recently become heavily involved with green activists who perhaps pushed him over the edge into a protest suicide with the intent of drawing attention to the plight of the planet? Did he have other issues which he couldn’t face which prompted him to commit suicide? Are the police 100% sure it WAS suicide? All quite odd. What a fascinating analysis of the CO2 cyvle, as well as the perspective on CO2 as a limiting growth factor. Please excuse the typo of your name. My journey to climate skepticism began as a believer as well. In retrospect, Mr. Morales said he knew Mr. Buckel had been upset as recently as February when he began discussing articles about the environment, for instance one about how 96 percent of human beings breathe polluted air and another about the Arctic Circle experiencing record breaking temperatures. Couldn’t he have used a more ecologically sound method? Sitting under a giant magnifying glass perhaps? The reflective person puts himself under the microsocope. The environmentalist under the magnifying glass. Air pollution does not exclusively originate from human activity, and can be greatly influenced by dust storms, for example, particularly in areas close to deserts. 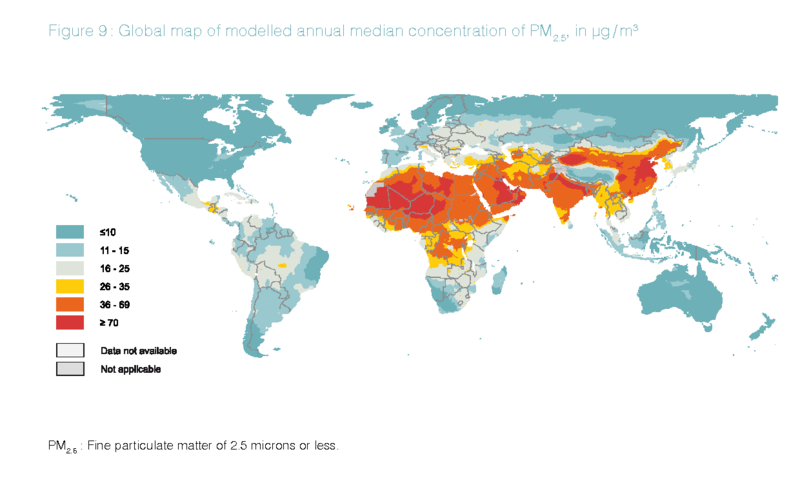 So yes, a lot of of people exposed to PM2.5 live in cities but non-anthropogenic dust is and always has been a feature in large parts of the globe. Hence the 92%/96%. There’s no way you’d get such percentages from urban pops alone – they account for only about half of the current world pop. Brainwashed to commit suicide, very sad.